Based on news coverage of the Ravitch Commission’s report, you could be forgiven for believing that most of Brooklyn commutes into Manhattan via automobile over the East River bridges. After all, reporters and sources act as though tolling the East River bridges represents a direct challenge to our American way of life. But it’s simply not true. In a survey a long time coming, the Tri-State Transportation Campaign noted the grave inequities among the numbers of commuters who drive and those who ride the subway. The report — released on Friday — is telling. “For example, according to the 2000 Census, only 3.1% of Brooklyn workers, 3.5% of Nassau County workers, and 4.4% of Westchester County workers drive alone to Manhattan to work,” Steven Higashide wrote on the TSC’s Mobilizing the Region. The fact sheets are just as telling. In Brooklyn, the borough potentially hardest hit by the tolls, 37.9 percent of all commuters head into Manhattan each day. 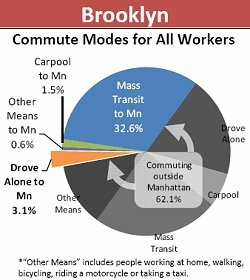 In total, 4.6 percent of Brooklyn residents drive into Manhattan each day either alone (3.1 percent) or via carpool (1.5 percent). On the flip side, 32.6 percent of borough residents rely on the subway. That’s 86 percent of all Manhattan-bound commuters on the train as opposed to 14 percent on the road. The numbers are rather similar across the entirety of the MTA’s Metropolitan Commuter Transportation District. Furthermore, those who drive make, on average, over $30,000 a year more than those who take the train. So not only do few people commute via car each day, but they do as a luxury. They should be, in other words, the people paying the tolls. It would be regressive, as always, to tax the straphanging public and not the driving few. Now, if only the politicians who control the fate of transportation in New York would awake to these realities, we could have hope yet. For some reason, though, I get the feeling that the fare hikes and service cuts will stay while the East River bridge tolls will remain free for the small percentage of people who use the bridges each day. That is backwards indeed. There you go again trying to use “logic” and stuff. You know that in the real world, things like logic and “facts” are too complicated to work into politics. Duh. That is one hell of a confusing pie chart. It took me a while just to figure out what it was actually showing. I recall one argument against bridge tolls is that it would hurt small businesses (florists and restaurants, for instance) that cross the bridges several times per day to make deliveries. I wonder if a cap (for instance, an E-ZPass tagholder would pay no more than one round-trip fare per day, regardless of number of crossings) would help appease some of this opposition. My dad owns a flower shop in Queens. My dad used to deliver in a truck to Manhattan–it’s no longer profitable thanks to the “time tax”– it takes too long, the gas is too expensive. There are business owners in the outer ring who are making the decision every day about getting into Manhattan, and the congestion fee is just putting a number on that. In other words, the cost of the toll is more than offset by the savings from not having to pay employees to sit in traffic, or from being able to make more deliveries per day. It’s possible that multiple tolls per day might add up to a net loss. I don’t have a problem with charging people only once per day, as was proposed for congestion pricing. I think that if in conjunction with the new tolls it was also stated that the MTA would start paying attention to the outerboroughs so that they have an adequate level of good mass transit then this might be easier to swallow. However with the 7 extension and the second avenue subway both being in Manhattan I can understand the resistance to this plan. I know the money is needed now to pay off debt but what happens when things bounce back? Will the MTA continue to ignore every borough not named Manhattan? There is a demand and a just one to be more forward thinking with our mass transit yet all that is being talked about is how the Ravitch Plan will plug the hole, at some point that hole won’t be there and then how will we proceed? I don’t buy it, John. Outer borough politicians have long worked against subway and commuter rail expansion, from the La Guardia train to the Rockaway Cut-Off. If there had been strong support for, say, extending the F train to the city line, it would probably have happened by now. The Ravitch plan does specify a massive increase in bus service in the outer boroughs before any tolls are put in place, but you might not know that if you relied on the TV networks for your transit news. As a part-time driver, I’ve liked no proposal as much as congestion pricing. I live in downtown brooklyn, and I’d kill for anything that stopped this flow of cars northbound from the ever-effed Gowanus over the free bridges. I generally avoid NYC during the workday in a car, unless I’m carpooling, in which case the toll would be no big deal at all. And at night, there’s no toll – because CP’s designers know there’s no sense tolling a non-scarce resource. Prohibiting Brooklyn and Staten Island families from using the West Side and FDR as alternatives to the BQE would destroy the BQE to no effect on the Manhattan surface streets. And IIRC, the money raised would’ve gone entirely to transit and emergency highway repair. I can also defend congestion pricing on purely capitalist grounds, which is appealing. It’s use-fees for scarce resources, and the market decides who goes in and who stays out. There’s no social engineering involved. It was a vastly superior plan to everything since proposed. This is America. If ten people need something that only four people can have, the _only_ equitable and just thing is to put a price tag on it high enough that only four can afford it. Subsidies for interest groups lobbying electeds are easily arranged after-the-fact by special ezpasses for your yellow or black car, etc.